Nicaragua: Here is where we are acting! Without any doubts Nicaragua is an impressive country: Stunning landscapes cover the area from the Pacific coast to the Caribbean. Active volcanoes are located in the west and a huge area of rainforest in the east of the country. On top of this the “Nicas” are exceptional lovely people with a beautiful culture full of traditions. However, the country is more known due to its civil wars, political problems, and natural disasters. Altogether these issues are causing misery within the society. In the region of Latin America and the Caribbean, Nicaragua is the second poorest country after Haiti. So it is not surprising, that health is a deadly serious topic. The economy of Nicaragua has been growing steadily within the last years. The economic growth in the year 2014 is estimated to be around 4.0 to 4.5 %. The most important export goods are: coffee, beef, sugar, peanuts, lobsters, shrimps, and recently also gold. However, the poverty indicators almost did not change within the last years. According to FIDEG in 2011, 44.1 % of the society was living under the poverty line; 8.2 % even in extreme poverty. In 2013 about 13 % of the employed persons were working in the agricultural sector. Industry and trade employed 18 % while 48 % were involved within the service sector. Overall the capacity of the labor market is very limited. Today most of the people, a bit less than 2/3 of the working people, are active in the informal sector without having a formal employment relationship. Beside poverty, the most serious social problems in Nicaragua are the weak and underfinanced education as well as the insufficient health care system. Also the social position of women remains critical in this culture marked by machismo even though a change is already noticeable. Just 19 % of the population is covered by public social insurance and thus has free access to special hospitals. The very few people, who can afford it, look for help within the private health sector. All other persons have to use the general public health centers and hospitals. However, these public facilities are not sufficient to adequately supply the population. Not all necessary surgeries could be performed due to the lack of equipment and capacity of these hospitals. In 2013, 76 % of the population was connected to the energy grid. But in many areas daily power failures are very normal. In the whole country no working waste disposal system exists. In big cities there is a waste collection, but the garbage dumps are causing serious health and environmental problems. In rural areas the waste is typically burned in the streets, backyards, or while cooking on open fires. The drinking water supply all over the country is not completely assured. In 2009 just 78 % of the population had access to clean drinking water. Waste water is mostly drained untreated. In rural areas the waste water is seeping away untreated or flows directly into a close river or lake. The public transport in Nicaragua is also insufficient. Existing streets are mostly in very bad condition. 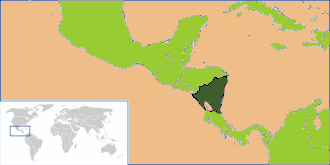 Due to its geographical location, Nicaragua suffers from natural disasters. Hurricanes, earthquakes volcano eruptions, and floods through heavy rainfall in the rainy season frequently cause very huge damages. The best known example was hurricane Mitch in 1998. Furthermore, environmental damages caused by humans are an increasing problem. For example the loss of fertile soils, deforestation, and the drying up of water resources are a serious threat. Increasingly construction projects come along with further environmental and social problems. Also environmental hygiene is inadequate. The drinking water quality, the waste water hygiene, the indoor smoke pollution and the outdoor air pollution in cities are problematic.